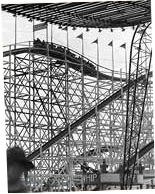 My neighbor Bob and I were reminiscing about “the good old days” at Cleveland’s famed Euclid Beach Park I recalled a creamy frozen whip…slowly descending in a thick, white ribbon down a chute…how it was taken off with a shovel like scoop and slapped on a cone with a flick of the wrist. The taste still lingered in our minds as we wondered if this frozen confection could still be found. We discovered that frozen custard was born at Coney Island, New York in 1919 when vendors began adding egg yolk to their vanilla ice cream to make it extra smooth and creamy. Frozen custard was enormously popular through the Depression and War years because it was delicious and inexpensive. 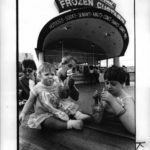 Problem was, real frozen custard was becoming harder to find because by the 1960’s custard makers, in an effort to increase profits, began reducing the cream (butterfat) content and increasing the amount of overrun (air) in their products. What was left on the market was either ice cream or ice milk. But we weren’t discouraged. We searched and found a handful of places that still made the old-fashioned custard we remembered. 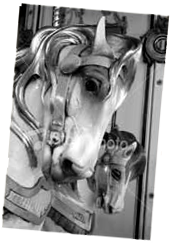 It took us years to perfect our recipe, design a machine, and develop a system. 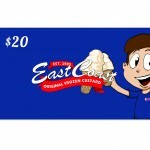 In honor of those Coney Island pioneers, we decided to call our company East Coast Original Frozen Custard. When East Coast finally opened for business in Parma Heights, Ohio in 1985 we held our breath. 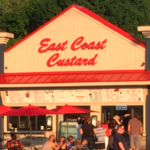 We erected tall neon signs with flashing lights, designed colorful menu boards and placed our machine front and center where people could see our custard being made continuously in fresh, thick ribbons. 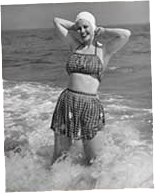 Each day as customers savored our recipe more and more people thanked us for reviving memories of Euclid Beach Park. We knew then that we had succeeded. You can taste THE WORLD’S FINEST FROZEN CUSTARD and yogurt at 5 Greater Cleveland locations. 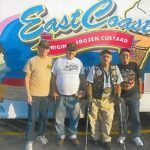 No matter what your age, or whether you’re a regular customer or tasting it for the first time, we’re confident you’ll keep coming back to East Coast Original FOR A TASTE OF THE GOOD OLD DAYS.